Okay, okay! Calling all my enchilada people to the table. Today’s post is the fourth in our Feeding a Broken Heart series, which is a collection of posts meant to inspire you to make healing food for the people you know, love, and care about. If you’re new here, I would love for you to know that this series was inspired by our adorable son Afton, his early birth, his passing, and his definite would-have-been love of enchiladas. I’m his mom and I just know these things. My friend Melissa was the one who got me back on the enchilada train after grief-eating (read: not eating) for a few weeks after we lost Afton. She brought over a small-ish size pan, due to our paranoid fear of freezer overload, of sweet potato black bean enchiladas which are totally not what I’m showing you today because she made it without a recipe, and I can’t try to replicate her genius level whimsy. But that got me thinking: what about that roasted tomatillo enchilada casserole? The ones inspired from Bread & Wine (affiliate link), the ones I used to bring to my friends when they needed some home-cooked love, the ones with the magically delicious and zingy ROASTED TOMATILLOS? Couldn’t we step those up into enchilada form? Answer: Yes. Enchiladas verdes reunion tour, happening now. These enchiladas verdes take a little bit of time, as all the best enchiladas do. But none of it is hard. Pinky promise. That’s why I’m calling them Simple Enchiladas Verdes. Really, they are simple. You’re talking to a girl who has about 2% energy for any given task at any given time these days, and even I managed this. Sauce. Which mostly involves roasted vegetables and flipping the switch of the blender on. Filling. Mixing up whatever you want to be in your filling, and may I recommend the last-minute addition of sautéed mushrooms? yaaap. you’re so there with me. Bake. Roll em up, drown in more tomatillo sauce and an extra generous handful of cheese, and bake. Mwah. And then your sprinkle cilantro down the middle, because you’re just that good. To be honest, other than the rock-out sauce, these are pretty humble and basic and chill, which makes them a REALLY perfect food to bring someone who needs a home-cooked meal to heal their heart. In really dire situations, they might be a good excuse to find your way into the fridge for a totally weird and wonderful midnight snack. Hypothetically. If it helps. Is it a diagnosis? a loss? an end to a season? Whatever it is, and whether it’s yours or someone else’s, just know that we’re sitting over here, eating these enchiladas, soaking up that same food-heals-everything power that you are. And all the better if we can do it by way heaping plats of cheesy enchiladas verdes, yeah? We are cheering for you. 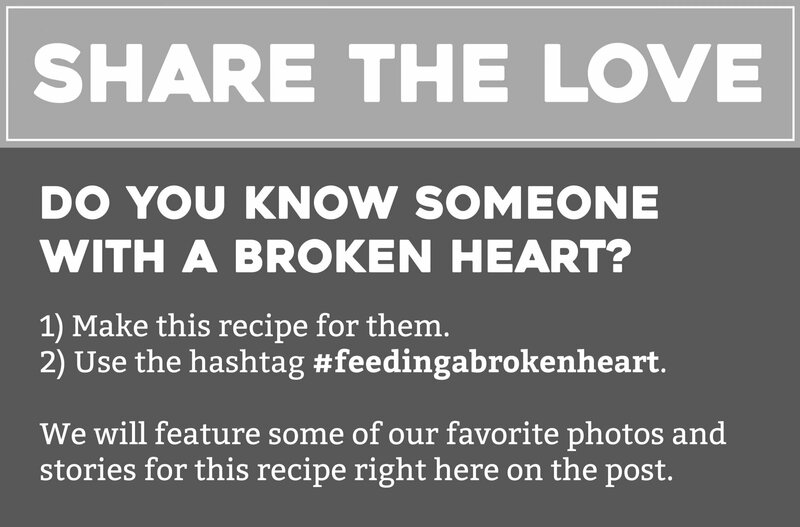 Love this recipe and you’re campaign #feedingabrokenheart . Enchiladas verdes are probably my favorite Mexican food and this version looks so delicious and comforting! Hi! Was wondering what size tortillas you used? Thanks! Hi Liz! I used 10-inch tortillas. I’ll update the recipe to say that. I love this – and the note to skip the rolling and make it the lazy lasagna way! The combo of cheese and tomatillos has a very comforting vibe. Definitely putting this recipe to good use. This recipe looks terrific. I make enchiladas a lot. Here’s a tip. Don’t dip the tortillas in oil or water, or they will come out tasting, umm, oily or watery. Instead, heat up some of the sauce in a large frying pan, and dip the tortillas in that before you roll in the filling. That way they stay soft when they are baking, and you get superior flavor from the sauce you have already made. also, suggested recipe edit. Tomatillos can be goldf ball sized or almost as big as a tennis ball. I would suggest giving a weight in pounds for the tomatillos, rather than quantity by number. I didn’t weigh them so I don’t know by weight. But I will add a more specific description. These look delicious! I’m so glad you’re up for making them! I also crave creamy baked food for comfort. I have a recipe for poppy seed chicken from previous generations that I would love to get pinch of yum ideas on how to modify it to be healthier. It’s the standard poached chicken, cream of chicken soup, sour cream, cracker crusted recipe which comes up when you google poppy seed chicken. I have never heard of that! I will look it up! That’s fine! and I like the tip about the yogurt with baking soda! Loving this series. Cooking a little spice is good for tastebuds and the digestive system. And it doesn’t hurt the heart either. Putting this enchilada recipe on the menu for family comfort this weekend. I need to make enchiladas! I am so glad to see you back in the kitchen / studio! And I love your #feedabrokenheart ! you are such a warmhearted person! And a real, real “value maker”!! I am so happy to see you writing again. I have followed your story since the beginning and each post made my heart break for you and your family just a little bit more. But I am so happy that you are back writing and trying to move forward. Your daily posts lift me up and make me believe that you will be ok. I just made this roasted tomatilla sauce 2 days ago(! )and was sending out my own comforting thoughts to you and Bjork while I was making it. Mexican food warms the body and the soul. thank you Jean! we appreciate it! Tomatillo-based green sauce has been on my list for a while now, but I was under the impression that it would be crazy ingredient-heavy. Super excited to try these! Every enchilada or enchilada casserole recipe I have ever made from this site has been fabulous!! So I am excited to try this one too:) Roasted tomatillos, YUM! That looks soooo good, yum! Those enchiladas look oh so yummy!!! Lindsay, you are killing it in this food series. Every recipe I’m immediately adding to my meal planning list for the week. Feeding the broken hearted? Absolutely. Feeding the Minnesotan? That too. These recipes are my heart. Love you friend. Your grace and courage are standards we should all follow. Oh boy does that look good. My head is spinning, thinking of how I can make a vegetarian version. Usually I put black beans in my enchiladas, but white beans might be just the thing for this recipe. I can’t wait to taste that sauce! On another note, I seem to have missed some of your posts for awhile. I didn’t realize you had lost your little darling. I’m so sorry to learn of his passing. I pray your hearts be healed a little more each day and that, miraculously, in the most unexpected ways, you find comfort at every turn. Thank you Nancie. It’s been an intensely difficult season. We really appreciate your love and support! Thank you Kathryn. Really, really appreciate your kind words. And I love the idea of making these veg! hope it works well for you! That sauce looks aaaaamazing! I’ve been off the enchilada train for so long, but I definitely need to jump back on! Hope you are doing okay setting back into a routine – thinking of you both. Holy enchilada this looks great!